With new iPhone models just around the corner, many existing iPhone owners may be thinking about upgrading and selling their existing devices to jump to new models. But before putting your iPhone on the market or trading it in, be sure to prepare it for sale the right way by backing it up, clearing out your data, and deactivating the device from your cell service provider. We’ll walk through exactly what to do to prep an iPhone for resale the right way with six simple steps. 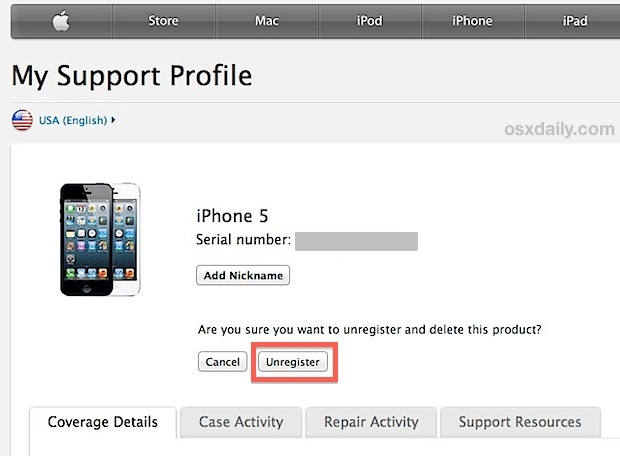 Regardless of whether you plan to sell the iPhone on Craigslist, eBay, to a friend or family member, or pass it over to any of the myriad of trade-in services, always take the time to back up the device beforehand. The reason is quite simple; with backups in place you will be able to upgrade to a new iPhone easily by migrating over everything, picking up exactly where you left off, with customizations, apps, settings, and all. We actually recommend making a double backup, one stored locally on a computer, and another stored in iCloud. Simple redundancy largely guarantees that you will have an easily accessible backup available when your new device arrives. When that finished, head over to iCloud to complete the second backup. Again, backups are essential for easily migrating from an old iPhone to a new one. When you get a new iPhone, you simply need to specify a backup to restore to and you’ll be on your way with all your settings, apps, and customizations on the new device. Piece of cake. Disabling iMessage for the phone insures that the number won’t accidentally get inbound iMessages aimed at you after it changes ownership. This is particularly important for CDMA providers like Verizon and Sprint, where there isn’t a SIM card to remove and the phone number stays active until it has either been deactivated or switched through the carrier. Easy, but important to prevent any mixups or lost iMessages. That’s it. Now the phone will no longer be associated with you or your Apple ID or Apple support profile. If you have an AT&T iPhone, set aside a few minutes to request a carrier unlock. Not only is unlocking the iPhone with AT&T is extremely simple, but it happens quickly these days, and you’ll often be done in as little as 30 minutes. The reason to bother is simple, it increases the value of the iPhone, often by $100 or more, because once unlocked it can be used on alternate GSM carriers, ranging from T-Mobile in the USA to a myriad of international service providers. iPhone models from other carriers including Sprint and Verizon may have an unlock option for devices with SIM card slots as well, though you will need to contact those carriers directly to inquire about their respective unlocks. Again, this boosts resale price considerably if you are selling an iPhone on the private market, so take the time to do it. Remember, you probably do not want deactivate the cellular account, and instead only the device itself, otherwise you may lose your phone number. This is very simple with GSM devices because the phone number and service is attached to the SIM card, whereas it’s a bit more complicated with CDMA providers since there is no removal SIM, and thus it’s best handled by a representative of the respective cellular companies. You’re almost done! Now all you need to do is erase everything off the iPhone and reset it to factory default settings. Only do this after you have made a backup, otherwise you will lose everything you once had on the iPhone itself. The reset process is pretty quick, and once completed the iPhone will reboot as if it was brand new, going to the standard welcome screen and setup process. Don’t bother going through the setup process, just let it be (unless you’re trying to help out the new owner, of course). Your iPhone is now ready to sell or go to it’s new home! Thinking about selling or upgrading a Mac too? Don’t miss our guide on preparing a Mac for sale the right way. Your account had a recent device upgrade. You can submit a new request 14 days after your last upgrade. For more information, please visit Device Unlock Support. BTW my upgrade was more than 14 days ago. More like 30. This also happened to me, but when I called ATT, the person was very professional and I immediately got the link and then confirmation that the phone was unlocked. Any need to deactivate home sharing on the old phone before erasing? Or will it deactivate by itself? Thanks for all the information. I have a question though. If I already got my new iPhone 6 & it’s backed up to the cloud & I do all the steps to my old iPhone 5 will it delete info on my new phone. I’m assuming I turn the new phone off before resetting the old phone. Thank you for any help you can give me. I’m giving the iPhone 5 to my sister so I’m not too concerned about safety but we do have to get it unlocked so she can change it from Verizon to AT&T. Again thank you. If i haven’t used the phone in over a year, and we’ve had new phones since then (I assume my mom deactivated the old one) am I okay to sell? Just remove the sim card?? Also, I forgot to unregister the phone with apple & went through with the rest of the steps, is it really necessary for me to go through the setup phase and then redo this process or am I okay…? Yes. You need to remove the Apple ID from the iPhone, disable Find My iPhone, log out of iCloud, then reset it as new to factory settings. Then remove the SIM card. I have an iPhone 5 which is smashed and won’t come on. Someone is advertising for broken phones. But my Apple ID is still on the phone. Is it safe to sell or should I just bin it ?